Value Through Superb Comfort. 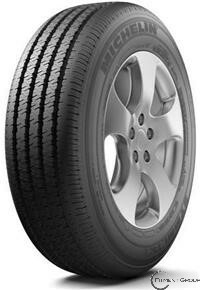 Michelin� Symmetry� tires offer an excellent all-season value with both whitewall and blackwall. Michelin� Comfort Control Technology� uses computer-optimized design and precision manufacturing to offer greatly reduced vibrations and road noise. An all-weather tread pattern includes wide center grooves for quick water evacuation, as well as variable-width sipes for exceptional traction in rain or snow, giving you better control when you need it most. EnergySaver Construction� helps deliver excellent fuel efficiency by requiring less effort from your engine.